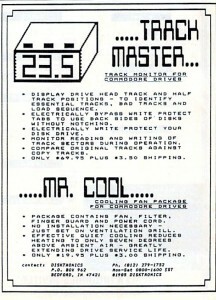 Track Master would display the 1541 drive head track and half track positions. This would help you to identify essential tracks, bad tracks and load sequences. You electronically bypass write protection tabs. BUT I can not find any more information about Track Master. How does it work, how does it install? etc.. The Trackmaster was an awesome device for it’s time. I do not have the exact documentation, but you had to cut a lead on the circuit board of the drive and then solder wires from the trackmaster onto the board. I was young and not very experienced when it came to soldering. I fried my first drive attempting to install the trackmaster, but was much more careful once I was able to afford a replacement drive.